On the spectacular and breathtakingly picturesque Island of Santorini, the couple, very much in love, enjoyed a gift to each other for their 10 year wedding anniversary. A short couple’s vacation without the children and a romantic anniversary photoshoot helped to create precious memories of their time together in Santorini and was truly a celebration of their love. As a European photographer, it is truly an honour and a blessing to have the opportunity to travel to such magical European wedding and honeymoon destinations. Santorini was, without a doubt, such a location. This stunning Greek island nestled in the vast, aqua and deep blue hued Aegean Sea has a grandeur and romance about it, but is not without a sensual ruggedness. This contrast leaves you feeling a great deal of awe, as you find yourself surrounded at once by both history and beauty. Did you know that 3,600 years ago, the island was the site of one of the largest volcanic eruptions known in history, and did you know that some theorize that this eruption was the source for the incredible legend of Atlantis? 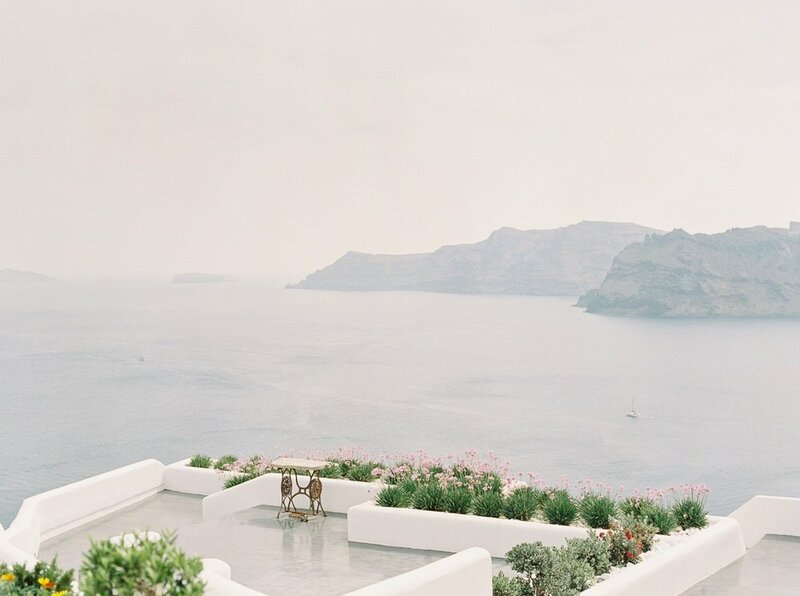 Santorini truly is a destination made for couples wishing to collect history, whimsy and splendour in their engagement, wedding or post-wedding shoots alongside the love and laughter certainly captured in each photograph. I had the undeniable pleasure of photographing Helena and Jakob in the picture perfect coastal town of Oia, surrounded by the Aegean Sea and washed in opulent blues and whites as far as the eye can see. During both the peacefulness of sunrise and the romance of sunset, we shot together as the couple created magnificent memories. Secreted away in stairwells and doorways, gazing at each other along seaside cliffs and on beautiful black sand beaches all while taking in the richness of the town around them, who wouldn’t love this? Helena and Jakob, after 10 years of marriage, were still so clearly and brilliantly in love. To be able to share this priceless and fun days with them was an honour, and a shoot I won’t soon forget. What would your ten year anniversary portrait session destination be? What’s your dream city to visit this year?